I can't think of a single person who isn't immediately taken with the mosaics sharing the story of Cinderella when they first visit Cinderella Castle. The stunning design and craftsmanship are enough to leave a lasting impression and require many, like myself, to make repeated visits to the murals. For those that revisit the mural regularly there are always new details to uncover, such as how Anastasia has a red hue to her to depict anger, while Drizella has a green tint to highlight her disgust and envy. The rest of today's story, featuring the artisans behind the mural, comes to us from our own archives. As it has been mentioned before, art takes so many varied shapes within Walt Disney World. While there are plenty of established galleries, many times the most stunning pieces of work can be found all around us. A common example of being surrounded by art is the Cinderella Castle breezeway where, along the walkway, are five five-by-ten foot mosaic murals comprised of hundreds of thousands of pieces of smalti, silver, Italian glass, and 14 karat gold. And while it may be common to walk by a piece of art with only a glance in its direction, it is even more common to not take note of the artist and their work. Today we’ll take a closer look at the two artists who crafted these extraordinary mosaic murals, Dorothea Redmond and Hanns-Joachim Scharff. Born in 1910, Redmond would go on to receive degrees from the University of Southern California and Art Center College before moving into motion picture design. During the first twenty years of her career she would contribute to many classic films, including Gone with the Wind, Sabrina, The Ten Commandments, and White Christmas. She was also a favorite of Alfred Hitchcock pictures, working on the films Saboteur, Rebecca, Shadow of a Doubt, To Catch a Thief, Rope, The Man Who Knew Too Much, and Rear Window. After years of working for Selznick International Pictures, RKO, Paramount, and Universal, Redmond came to WED Enterprises, now known as Walt Disney Imagineering, and began work on Disneyland’s Plaza Inn and New Orleans Square. As part of the New Orleans Square project, Redmond created a private quarter for Walt Disney and his family, The Royal Suite, which was never completed. The space was occupied by several tenants, including The Disney Gallery from 1987 until 2007. In 2007, The Royal Suite’s designs were dusted off and given new life as The Dream Suite, accommodations that would house one lucky guest and their family in the park for one evening. With the Walt Disney World project, Redmond and her watercolors were once again utilized to shape the sumptuous spaces of Main Street U.S.A., Adventureland, and Fantasyland. 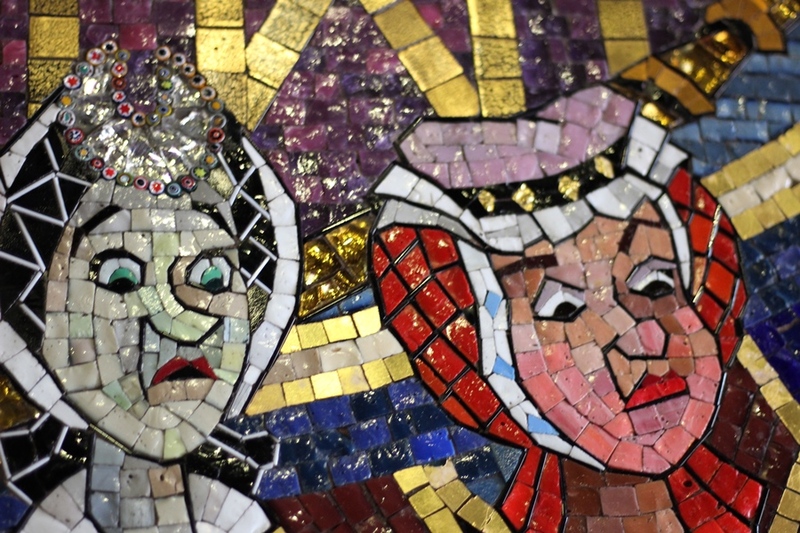 Between 1970 and 1971, her skills were utilized in designing the Cinderella Castle mosaic murals that paid tribute the original Disney animated feature, but also gave new life to the story in their own way. These designs were later duplicated in Tokyo Disneyland as well. Dorothea Redmond was inducted as a Disney Legend in 2008 before passing away in February of 2009. Born in 1907 in East Prussia, spent his formative years studying a variety of art forms, including weaving and mosaic. His early career in international business led him to become the Director of the Overseas Division for Adler Automotives for the decade prior to the outbreak of World War II. While in Germany in 1939 his visa was revoked and he was left stranded until he was drafted. After several duties, Scharff’s fluency in English granted him the position as an interrogator from 1943 until 1945. Among his charges was the interrogation of pilots and aircrews for many of the Allied Forces. His interrogation techniques, which included walks in the woods, sharing food, visiting captured pilot’s comrades in the hospitals, but never physically harming prisoners, were ground-breaking. After World War II Scharff was invited to lecture with the United States Air Force and his techniques were later adapted for use in U.S. military interrogation programs. After immigrating to America, Scharff did not return to business, but rather the art he had studied as a younger man. His work took him from Manhattan to Los Angeles, via a successful exhibit at Neiman Marcus in Dallas, where his mosaics could be seen in UCLA, Los Angeles City Hall, USC, the California State Capitol Building, and even the pool at the Hilton in Las Vegas. Scharff headed the artisan team, which included his daughter-in-law Monika Scharff, which brought Dorothea Redmond’s watercolor designs for the Cinderella Castle mosaic murals to life. Scharff and Scharff, as they were now known, would go on to craft lush mosaics including the twin mosaic murals at Epcot’s Land pavilion. While Hanns-Joachim Scharff passed away in September 1992, Monika Scharff has kept their art alive, well, and still tied to Disney, as her work can be seen in the fountains of Disneyland’s Downtown Disney. The stories of these two artists’ lives are as varied as their creations and as nuanced as the tiny pieces of cut glass used in their joint work. Art is all around us, even in Walt Disney World, and it not only compels guests further into a story, it makes us a part of the artist’s life story.